For Bradley Wiggins and Chris Froome in 2012, read Bjarne Riis and Jan Ullrich in 1996. Or Bernard Hinault and Greg LeMond in 1985. We have an experienced leader in the yellow jersey, supported by a stronger-looking team-mate who, from the outside, looks like he is being held back from having his own shot at glory. On the climb to La Toussuire, Chris Froome was following the single-minded tactic that Sky have followed since the start of the race: protect Wiggins. On all the significant climbs of the race so far, the Sky domestiques have queued patiently for their turn to ride themselves to the point of exhaustion until only Froome and Wiggins have been left. But with about five kilometres to go to La Toussuire, Froome went off-piste. He attacked, Wiggins was put into difficulty, and it looked like the balance of power was shifting live on our screens. It was only when what we can assume were panicked orders shouted over the race radio registered with Froome that he tapped his ear, looked back and slowed up to wait for Wiggins. What did it mean? Was Froome unfairly held back from taking his own opportunty to win the Tour de France? As Wiggins himself would tell you, real chances to win the yellow jersey don’t come along that often. It’s a soap opera, a classic Tour story. Once both riders’ partners had weighed in on Twitter last night, the story grew legs and ran. This is a Tour that has been notable for the lack of intrigue or suspense around the battle for the yellow jersey – Bradley Wiggins’ form, combined with his careful avoidance of bad luck, have meant that the Brit has looked unbeatable. Even now, against the background of the brewing leadership psychodrama, he enjoys a lead of over two minutes, and we still await the deployment of his primary weapon in the final time trial. Sky remain committed to Plan A. Wiggins leads. Froome and the rest of the team support. They still see that the clearest path to the yellow jersey in Paris, which is their only aim in the race, is via Wiggins. Froome’s partner Michelle Counde tweeted that Froome felt Wiggins was capable of looking after himself on La Toussuire. If Froome had carried his attack through, it’s possible to project that Wiggins would have lost no more than 30 seconds, probably fewer, with Vincenzo Nibali and Jurgen Van den Broeck somewhere in between. The net result would have been Wiggins in yellow by a reduced margin, with two of Sky’s rivals closer to him. That’s a less strong position than they started the day. David Brailsford insists that the process of preparing for the Tour involves working out every possible scenario, and the consequent outcomes, with decisions based on that. The most likely scenario is still that Wiggins is the strongest candidate for the overall win, with the added bonus that Froome is just ahead of Nibali and can act as a watchdog over the Italian. But there’s also the scenario that Froome is significantly stronger than Wiggins. They reacted too late to this one in the Vuelta last year and it cost them the race. However, the current scenario is that Froome looks a bit perkier in the mountains, but is two minutes down and is not as strong in the time trial. If Froome has another go in the Pyrenees, and draws Nibali clear of Wiggins, it would put the Italian closer to the yellow jersey. Plan A still looks the safest. Conservative tactics? Yes, but strong defence has won many Tours. I like exciting, attacking racing as much as the next man, but then again, I’m not in a position to win the Tour de France in just over a week. With only two significant mountain stages left, Sky have worked out that a Wiggins win is going to be easier to achieve than a Froome win. In the stage to Luchon, the difficulties are front-loaded, while Peyragudes, the finish of the following stage, is much easier than La Toussuire. And the final time trial casts a long shadow over what remains of the race. The likely outcome of that stage is a Wiggins win, Froome a little way behind, and nobody else close. That’s first and second place guaranteed, with none of the added risk of inviting anybody else to the party. It’s unfortunate for Froome that he lost a minute and a half on stage one, thanks to a mechanical problem, and if he hadn’t lost that time, we’d be looking at a very different scenario now. But it happened. Wiggins faltering in the Pyrenees hasn’t, so Sky would be taking a risk if they contributed to that happening by giving Froome his head. If Froome hadn’t lost that time early in the Tour, it would be fascinating to see how Sky’s management dealt with it. I suspect that Wiggins, the golden boy of British cycling, would still be favoured, but luckily for David Brailsford, he doesn’t have to be in that situation. 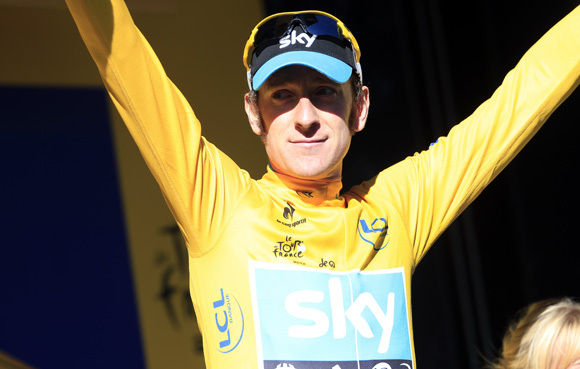 With nine stages left, and the GC looking as it does, Sky are right to stick with Wiggins. It’s not going to make the race more interesting for neutral fans, but that’s not Sky’s problem. Cycle Sport’s Tour village: All our Tour coverage, comment, analysis and banter.